Well, I say today is day 28, but others in the program are celebrating day 30. So who knows?! I will continue until someone tells me to stop. Cooking bacon in the morning is time consuming! I usually allow myself about 15 minutes to cook and eat my breakfast but when bacon is included, that turns into about 25 mins. It is totally worth it but something I have to plan for. While the bacon is sizzling, I try to multi-task. Most mornings I can get a lot of dishes washed while my breakfast cooks. Obviously preparing all your meals means you are ALWAYS doing dishes. There is an endless number of dirty dishes...the dishes never stop... Sorry...I get distracted when I think about dished. 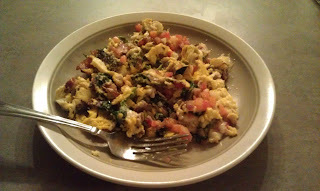 Breakfast was two eggs scrambled with bacon, mushrooms, spinach, and salsa. KALE! where have you been?! 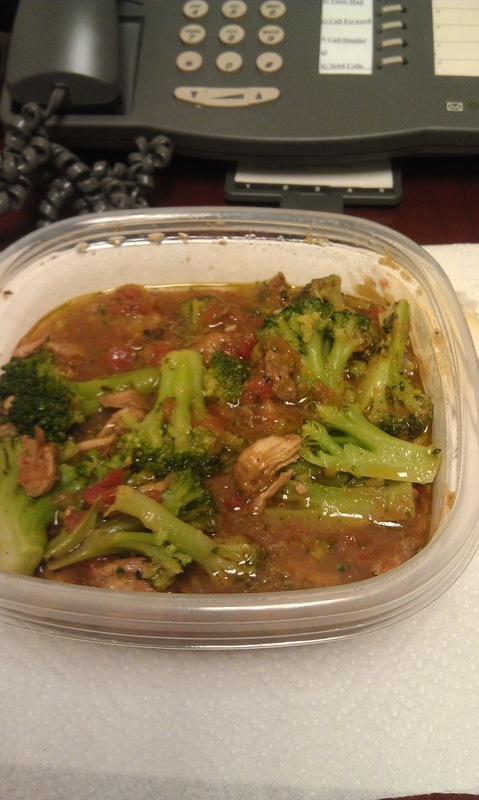 Lunch was pretty late today but this held me over. 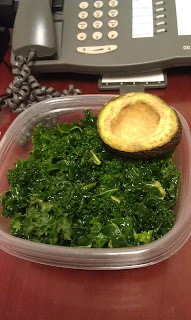 Kale dressed with olive oil and lemon with a half avocado. No pictures of dinner! :( I went to Lincoln, a restaurant in DC and completely forget to take pictures. I need to find a way to remind myself to quickly snap a picture when I am eating out. Honestly, it is the last thing on my mind and I seriously have to make a conscious effort to remember. So last night's meal was part of DC Restaurant Week (A great way to try some local places that you wouldn't normally be able to afford). Their menu was extensive with lots of delicious seasonal small plates. Lincoln gets locally sourced food from VA, MD and DE. I am not sure this was a great value for restaurant week since most of the "small" plates were priced at about $10 each and I got 3 small plates for the prices of $35.13. You do get a 4th plate, dessert, but I had my packed to go and put it in the freezer for a rainy day. The other three plates I got were 1) two pieces of pork belly (yum!) 2) roasted brussel sprouts (currently my fav vegetable) and 3) grilled broccoli and turnips. (this was not what I expected but was just delicious). It was a great meal, with even better company! While the food was amazing, the restaurant itself was really LOUD and got louder through the night. So if you are trying to catch up with friends, this may not be the ideal place. However, I would like to go back in about 4 weeks to try some of their cocktails, they looked DELICIOUS!